Author of "Learning to Live: Essays on Life & Leadership" & "Value Driven Leadership"
Man was born to turn the world into paradise, but tragically he was born flawed. And so his paradise has always been spoiled by stupidity, greed, destructiveness, and shortsightedness. 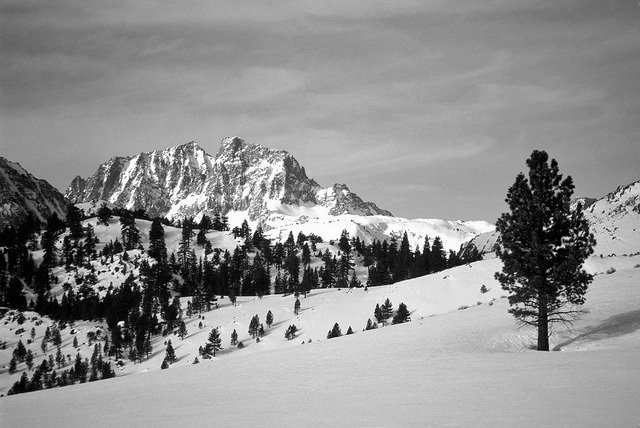 Alone on Thanksgiving 2001, I was a solitary figure as I walked north along County Road 23, two miles south of Ridgway, Colorado — the northern entrance to the San Juan Mountains. 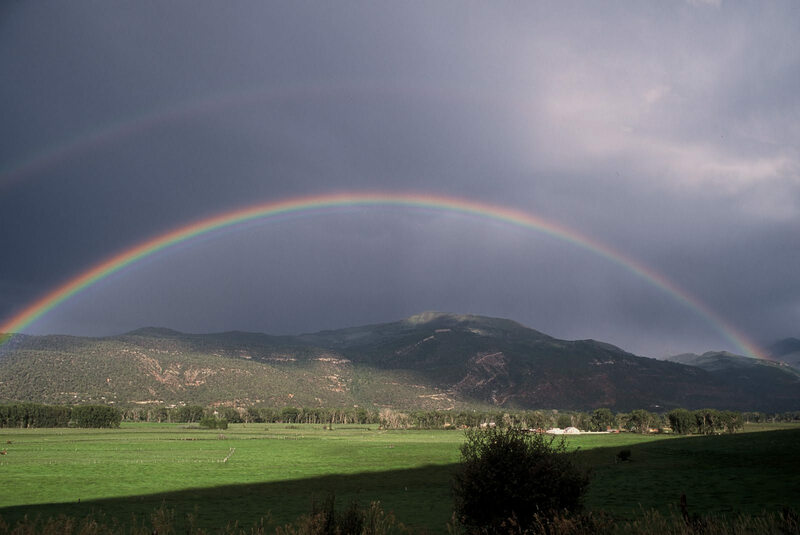 The snow-topped San Juan’s rim the Uncompahgre Valley, home of farms, cattle ranches, and magical rainbows each April. Cows and horses dot the fields below. I felt peaceful. The day awakened brisk and flowed toward me from the mountains to the east. My boots crunched the gravel. The cool air burned my cheeks. The morning sun warmed my skin. Magpies, bluebirds, and blue jays sat on the fence posts and in the trees along the road and dashed and darted about. I could feel the interconnected energy of the life around me—including myself as I too am part of nature. How long can we live well on this planet when we extinguish 200 species a day to expand economic growth so we can feed, house, and enable the material and emotional addictions of our global over-population? Each day the threats of climate change grow more ominous. Will we change? Nature has a deep purpose: to sustain the conditions for life—not necessarily human life but the existence of creativity and aliveness. Nature will survive humans; will we endure our own destructive flaws and learn to care for our home on earth instead of constantly diminishing her for more and more stuff and people? If we provoke her too much, she will turn her wrath on us more than she already has. Nature expresses her passions without mercy or sentiment, and she always wins. The longer we wait, the more we and all of nature will suffer. I paused on my walk and said hello to two favorite young cows–“Brown” and “Tan,” I called them. They ignored me, and I moved on. A dozen deer, ears perked, stood frozen 30 feet away and watched me pass by. The local marmots rested in their homes. I saw no one and, other than the sounds of nature, my boots on gravel, and my breathing, my walk was quiet. I was in a reflective mood. How can anyone believe they can control nature? 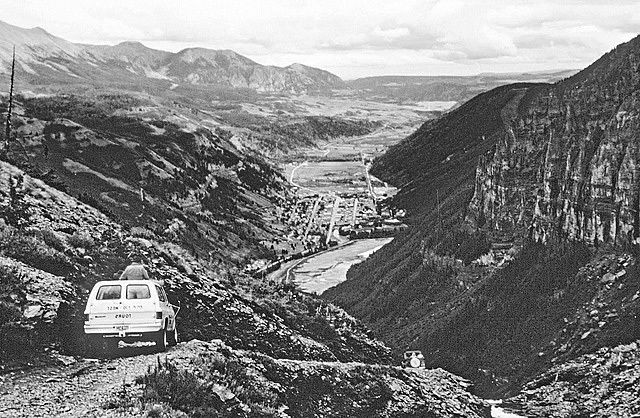 I thought about a recent experience: I drove my jeep 12,000 feet above sea level on a narrow path of an old mining road. I was a few miles east of Silverton, 30 miles south of where I lived. A sudden rainstorm began washing the clay beneath my jeep away, and my vehicle began to slide back down the mountain close to a steep ledge. I went with her pull until I saw an opportunity to maneuver out of the slide. Nature reminded me of my powerlessness and humbled me. I walked to the white house on the curve of the road into Ridgway, drank some water, waved to the barking yellow lab, and turned around for the walk home. In the spring, a couple of hundred skittish elk will graze in the meadows below me. Variety surrounded me on my walk. Diversity promotes adaptation and sustainability. A monoculture foreshadows death. The return trip climbed uphill from about 7,200 feet. My breath got faster and deeper and my legs felt the strain. I finished my water. Finally, head down, I trudged up the curved and rutted incline of the long driveway to the A-frame home nestled against the side of the mountain. I lived in the loft. I sat on the picnic table near the back door and under the deck; I was hot and wet with sweat. I breathed heavily. I notice Skeeter and Tate — two cats larger than Noga, my Westie — hunting in the brush. I felt alive. I muttered an expletive under my breath in acknowledgment of the hard effort. I loved this three-mile walk in nature, which provided a milieu for creative contemplation. I was old enough to find it harder to believe in a loving God as I did as a child. I tried to figure out how I can believe and still see humanity as it is: so often cruel and unjust. As I caught my breath, I thought back to when my brother Allan and I took a trip to East Africa for 18 days of wildlife photography in Kenya and Tanzania. 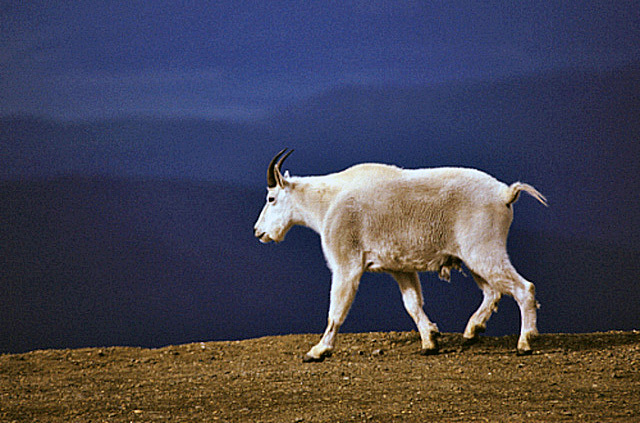 The animals were excited, spirited, and expressive — they ran, jumped, and played. A Pride of lions slept, sunned themselves, and lounged while mischievous cubs played and irritated their elders who cuffed them gently. A large group of giraffes loped across the plain. Two cheetahs stalked Thompson gazelles. A soundless leopard carried a young wildebeest into a tree to feast on for the next two or three days. Animals kill for food; not for ego or trophies. Elephants lumbered in front of the gigantic and snow-covered Mount Kilimanjaro as filled with excitement, I fumbled with my camera. I watched the chaos of the annual wildebeest migration as two million grazers followed the rain. I began to sense the deeper order, programmed genetically over thousands of years, of their seemingly insane behavior. Order exists beneath chaos. As I caught my breath, I decided to go and soak in the hot springs in Ouray — eight miles south at the front door of the San Juan’s. 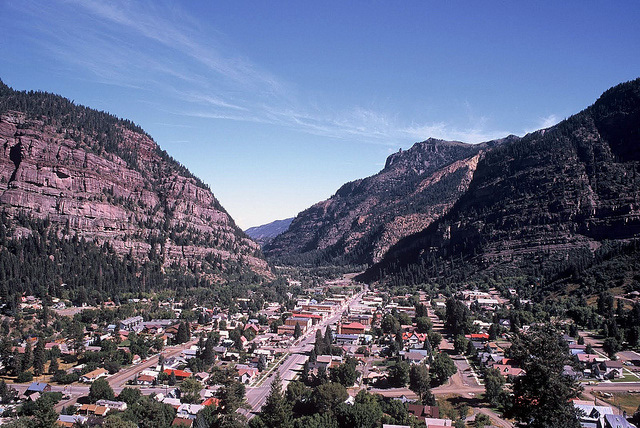 Many years prior, I drove around the mountain curve on highway 550 into Ouray. I saw the steam from the hot springs rising to the mountains. I was drawn to this beautiful place, and I returned several times to drive the old mining roads. One day my divorce, my mom’s death, and the surprise death of my best friend provided the deep awareness of fragile and temporary life, and I loaded my jeep and drove West to grieve and live out my dream of living a year in the mountains. 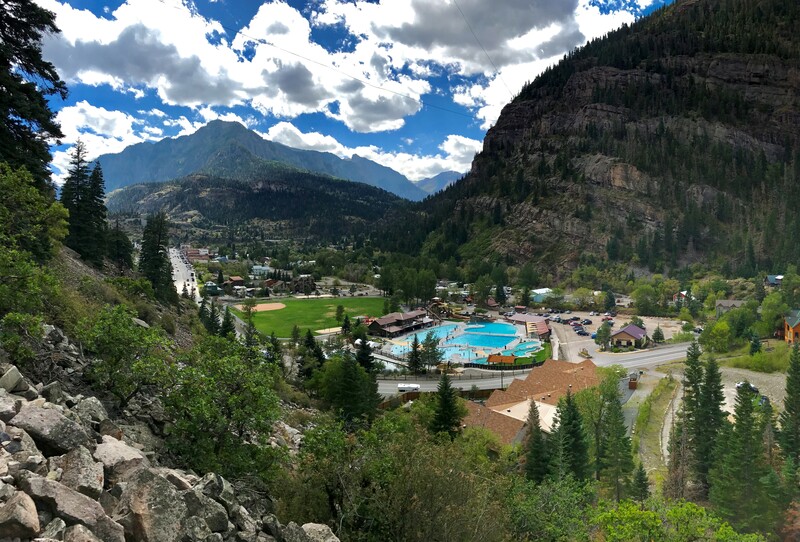 The large hot springs pool sits surrounded by mountains and the town of Ouray — a tiny piece of Western history nestled in a bowl at the foot of the San Juan’s. I relaxed in the pool, drank water, and watched rock climbers, mountain goats, small avalanches, and the deer feeding in the adjacent park. Often I sat for hours and thought, other times I read, and I talked with locals and tourists. In the winter, the steam rises from the hot water, and often I can only see a foot or two in front of me. The pool fills with people when it snows, and snow-covered heads appear to float on top of the warm water. I sat in a small skiff in the San Ignacio lagoon in the Mexican province of Baja California Sur. The boat bobbed in light waves. I watched as a 40-foot-long, 40-ton great gray whale surfaced beneath the boat and introduced her new child to the boat’s elated observers. I peered into a large serene eye of the mother and wondered: What is her world like? Her gentle and knowing return of my excited stare linked us in a mystical moment. I realized that in one slight movement she could destroy the boat and kill its occupants. Instead, she chose to form a relationship with us — a profound choice: destroy or relate — the essence of competing worldviews in my world. For the animal shall not be measured by man. In a world older and more complete than ours they move furnished and complete, gifted with extensions of the senses we have lost or never attained, living by voices we shall never hear. They are not brethren, they are not underlings; they are other nations, caught with ourselves in the net of life and time, fellow prisoners of the splendour and travail of the earth. People, the whales, and the lions are animals. It’s our job to use our gifts to nurture the planet not consume it for things we don’t need. I feel sorrow for our planet. Nature and America have declined since 2016: under assault by those who feel entitled to destroy our natural world for ego and money; they never get enough. A few years ago, I stood alone in Canyonlands National Park near Mesa Arch. The sky was dark at 4:30 am. I looked up at the cloudless sky and saw the star-filled cosmos. I felt overwhelmed with awe and humility. Fear too. I felt the pain of my insignificance. The questions and mysteries of life swirled in my mind. I’m not the center of the universe: I am minuscule in my brief moment as a participant in the interconnected natural world. 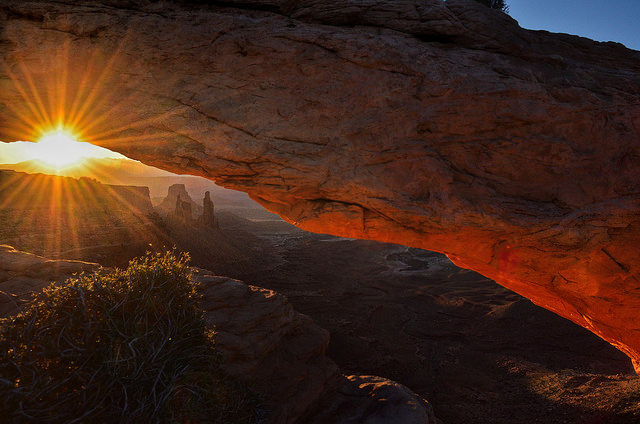 Two hours later, I stood in front of Mesa Arch and watched as the sun rose in the distance. Daniel Quinn was the author of the quote that is the title of this essay. I hope future generations will be able to have their own journeys into nature. It will change them as it will continue to change me. 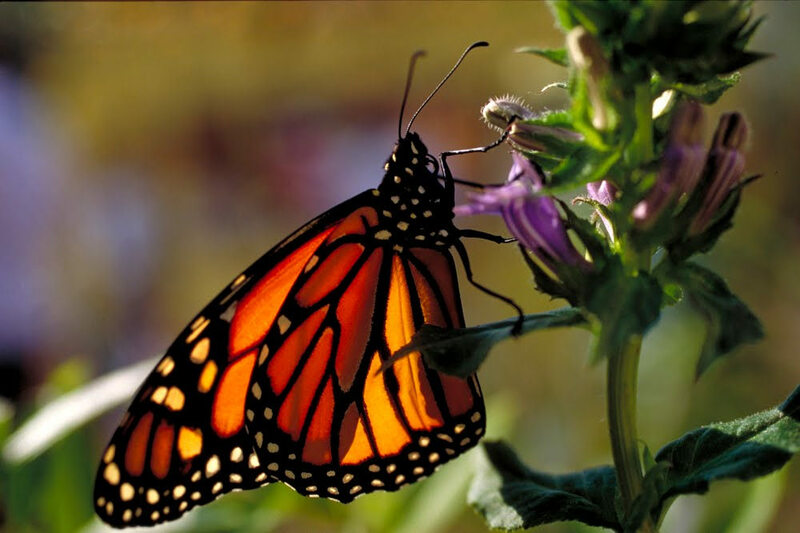 Monarch Butterfly: an endangered species. We live in a frenetic and connected world. We fear anonymity. Everyone wants to be known. We live chronically overscheduled. We conform without thought. And we lose our ability to be alone. Too many of us have left our souls far behind us. 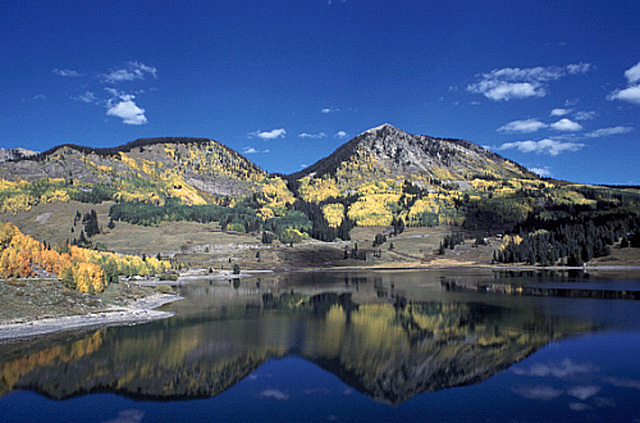 I lived for 14 months on the side of a mountain above the vast Uncompahgre valley between Ridgway and Ouray, Colorado. I lived alone and spent much time by myself. Ouray has wonderful hot springs pools and I spent about 250 sessions in one of them. Sometimes I read. Other times I sat and thought. Once in a while I talked with another person. My dog and I drove the 4-wheel drive mountain roads in the San Juan Mountains that surrounded Ouray. I photographed the mountains and the valleys. I took long and quiet walks on dirt roads and looked down on the farms and ranches in the valley. And I had authentic conversations with my friend whose home I shared and with clients who visited me. I felt connected to the life around me. I grieved the loss of my mother, my mentor and my long marriage in the mountains. I thought about life and leadership and reflected on what really mattered to me. I went face to face with my inner demons, doubts and decisions to be made. I contemplated my values, vision and purpose. I deliberated about what, for me, constituted a life well lived. This time in the mountains was a time to be alone and to slow down–a time for reflection and thought. I wanted time to think and ponder — to try to see the patterns and order of life in a chaotic world where making sense of so much nonsense may not be possible. The time of solitude in the mountains, away from conformity and on the edges of the systems of my life, brought forth new perspective and new possibilities for me. My commitment to my idealism grew stronger. Time alone sowed the seeds of my next adventure. I felt new and deep stirrings. I felt connections grow stronger and deeper. I did not know where my new sense of calling would take me, but I would listen and heed the message because I must if I wanted to feel alive. Creation requires the fear, discomfort and loneliness of separateness. In isolation we listen to our inner voice. Silent concentration and contemplation provide the place for connections to be made and insights to be gleaned. From quiet reflection inspiration grows, intuition surfaces, and understandings emerge. We reflect on our experiences and imagine possible future scenarios. Solitude became a comfortable friend. I go too fast for my soul sometimes. My spirit gets angry. I need time to catch up with myself. I want time to think. I crave solitude. I look forward to upcoming extended time in the natural world. In late 2000, I packed up my jeep and headed for a spot in the Uncompahgre Valley between Ouray and Ridgway, Colorado. I’d visited this beautiful area many times over the years and vowed to live there for a time if I had the chance. 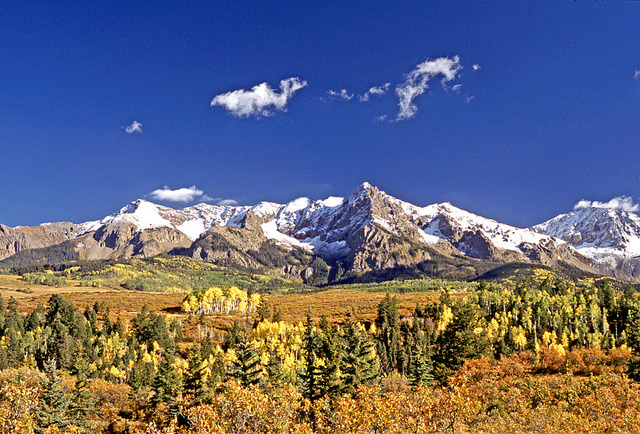 Well, I took that chance and spent all of 2001 and a few months of 2002 living, working, and photographing the beauty of the San Juan Mountains and the area around Ouray, Ridgeway, and Silverton, Colorado. 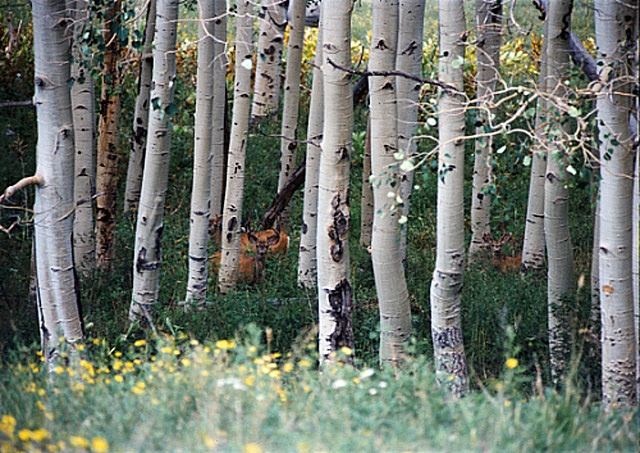 There are four deer in this image. At the top of Mt. Evans (14,000 ft). I call this the lone cowboy. The valley I lived in. I am alone on Thanksgiving. 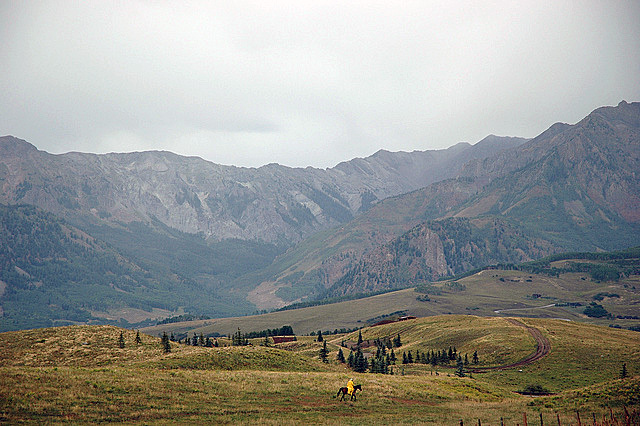 A solitary figure, I walk north along County Road 23, two miles south of Ridgway, Colorado — the northern entrance to the San Juan mountains. I live in the loft of an A-frame home behind me along the dirt road. 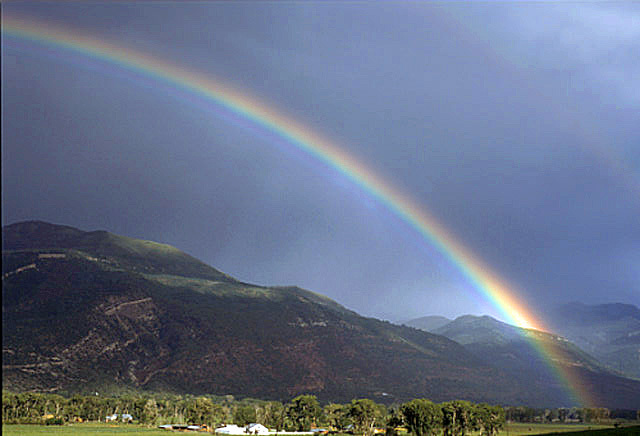 The snow-topped San Juans rim the Uncompahgre Valley, home of farms, cattle ranches, and magical rainbows each April. Cows and horses dot the fields of the valley below. I feel lonely but okay. The day awakened brisk and beautiful and flows toward me from the mountain to the east. The gravel crunches beneath my boots. The cool air burns my cheeks. The new sun warms my skin. Magpies, bluebirds, and blue jays sit on the fence posts and in the trees along the road and dash and dart about. Life thrives around me, and I am part of it. All of life is a family dependent on the interconnected energy of all. I pause and say hello to two favorite young cows — “Brown” and “Tan,” I call them. They are indifferent to me, and I move on. A dozen deer, ears perked, stand frozen 30 feet away and watch me pass by. The local marmots are in their homes. 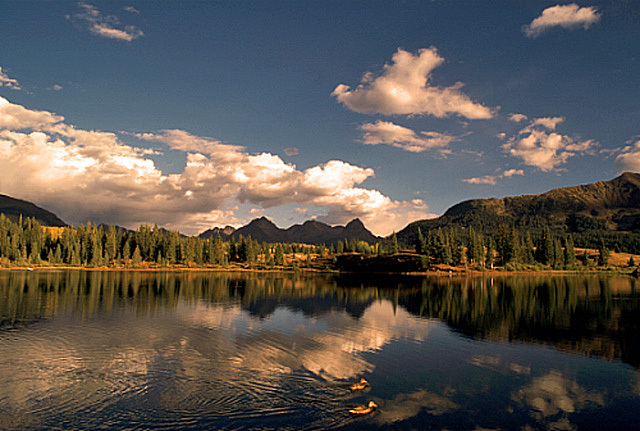 I see no one and, other than the sounds of nature, my boots, and my breathing, the air is quiet. I am in a reflective mood. How long can we live on this planet where we extinguish 200 species a day to feed our global population? Will we change? Nature has a deep purpose: to sustain the conditions for life — not necessarily human life but the existence of creativity and aliveness. Nature will endure; will we? Nature teaches us about sustainability; she doesn’t share our values. I was once in the middle of a tornado, I’ve dug out of massive blizzards, and battled a record flood. 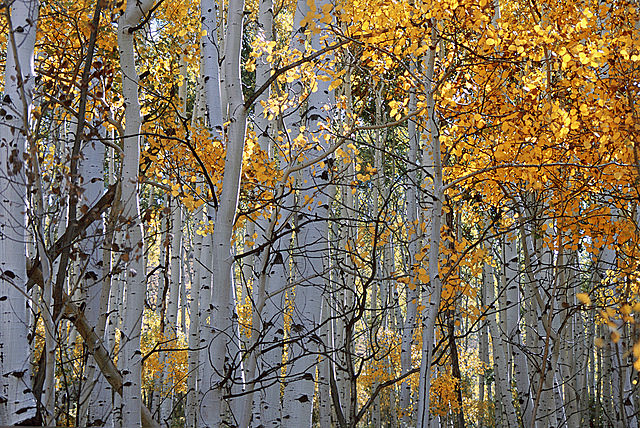 In each violent act, nature expressed her passions and moved on without mercy or sentiment. The next day the sun often shined and the birds sang as nature’s gentleness returned. If we provoke her too much, will she turn her wrath on us? Nature is deeply authentic and filled with spirit, purpose, meaning, and mystery. I look at the powerful mountains and wonder how anyone can believe they can control nature — how afraid of her power they must be. I think about a recent experience: I drove my jeep 12,000 feet above sea level on a narrow path of a trail. I was a few miles east of Silverton, 30 miles south of where I lived. A sudden rainstorm washed the clay beneath me away and my jeep began to slide backwards down the mountain perilously close to a steep ledge. Nature reminded me of my powerlessness. I went with her pull until I saw an opportunity to maneuver out of the slide. I am humble before nature. I walk to the white house on the curve of the road that leads into Ridgway, drink some water, wave to the barking yellow lab, and turn around for the walk home. In the spring a couple of hundred elk will graze warily in the meadows below me. The diversity that surrounds me on my walk promotes adaptation; a lack of diversity foreshadows death. I swing my left arm — exercise for a pulled muscle — as I walk. The return trip climbs gradually uphill from about 7,200 feet. I breathe faster and deeper and my legs feel the strain. I finish my water. Finally, head down, I trudge up the curved and rutted incline of the long driveway to my rather majestic-looking A-frame home nestled against the side of the mountain. I sit on the picnic table near the back door and under the deck; I am hot and wet with sweat. I breathe heavily. I notice Skeeter and Tate — two cats larger than Noga, my Westie — hunting in the brush. I feel alive. I mutter an expletive under my breath in acknowledgement of the hard effort. I love this almost daily three-mile walk that puts me close to nature and provides a milieu for creative contemplation. I’m old enough to find it harder to believe in a loving God than as a child. I try to figure out how I can believe and still see humanity as it is: so often evil, cruel, and unjust. As I catch my breath, I think back to when my brother Allan and I took a trip to East Africa for 18 days of wildlife photography in Kenya and Tanzania. The animals were excited, spirited, and expressive — they ran, jumped, and played. Prides of lazy lions slept and sunned themselves while mischievous cubs played and irritated their elders who cuffed them gently. Large groups of giraffes loped gracefully across the plains. 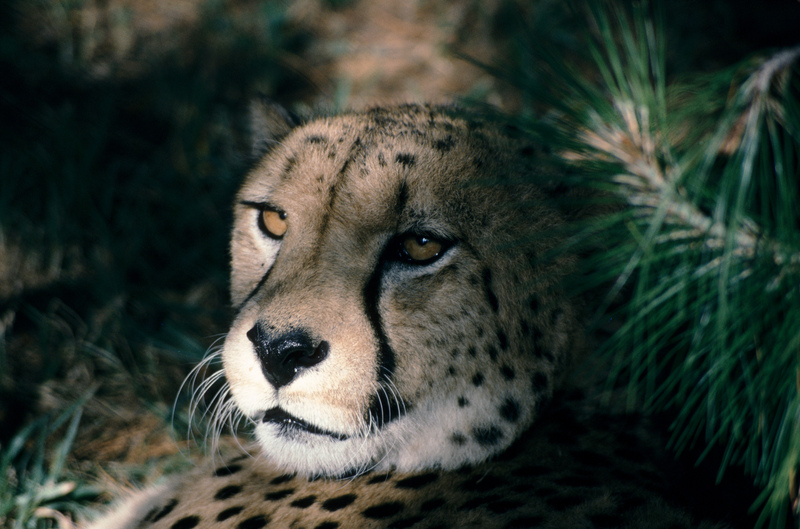 Two or three cheetah quietly stalked Thompson gazelles. A silent leopard carried a young wildebeest into a tree to feast on for the next two or three days. Elephants lumbered in front of a gigantic and snow-covered Mount Kilimanjaro as, filled with excitement, I fumbled with my camera. The daily drama for food played itself out in front of us. What an authentic and powerful place this is. I observed how life in the Ngorongoro Crater, a collapsed volcano with steep walls, had evolved and cooperated so all of the elements fit together to create a balanced whole — an ecosystem upon itself. I watched the chaos of the annual wildebeest migration as hundreds of thousands of animals chased the rain. I began to sense the underlying order, programmed genetically over thousands of years, of their seemingly insane behavior. Hundreds of thousands of wildebeest births occur within a three-week period, during the annual migration to water. This mass birth preserves the species, for predators cannot kill that many young before they can care for themselves. Wildlife photographer Mitsuaki Iwago calls this underlying order “Okite — a law of natural life that’s neither glamorous nor indulgently savage.” Nature adapts and designs and all of life plays an authentic role, with an unimaginable intelligence. Order exists beneath chaos — observable, in part, to the mindful. I wondered if the rich diversity of Africa will survive humankind’s abuse, greed, ignorance, and arrogance. I hope so but am doubtful. 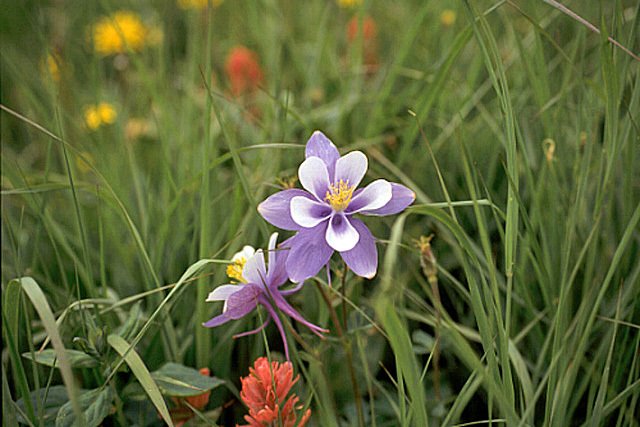 As I sat at the picnic table, I thought of my time in Colorado. This was a time for solitude, and a time for reflection on how to live. I sought to balance action with contemplation. I required more time to think and ponder — to try to see the patterns and order of life in a chaotic world where making sense of so much nonsense may not be possible. 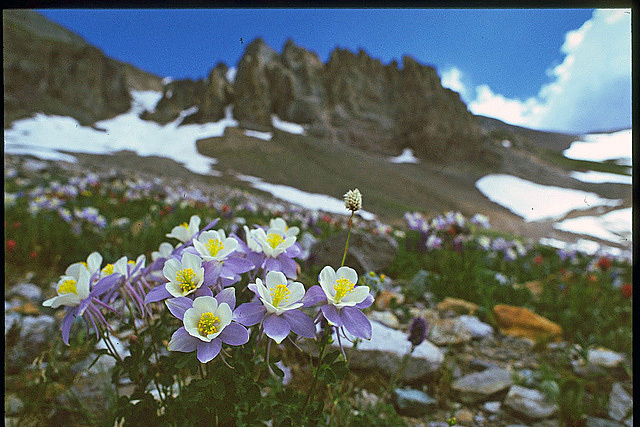 I appreciate the beauty of my surroundings, the quiet walks, and the spirituality of the San Juan mountains that surround me. My retreat to the mountains is also difficult — like a long vision quest filled with freedom’s anguish. I face my fears, losses, and the anxieties freedom provides. I wrestle with my resistance to authenticity: denial of truth, self-delusion, and self-imposed demands and limitations. As I catch my breath, I decide to go and soak in the hot springs in Ouray — eight miles south at the front door of the San Juans. 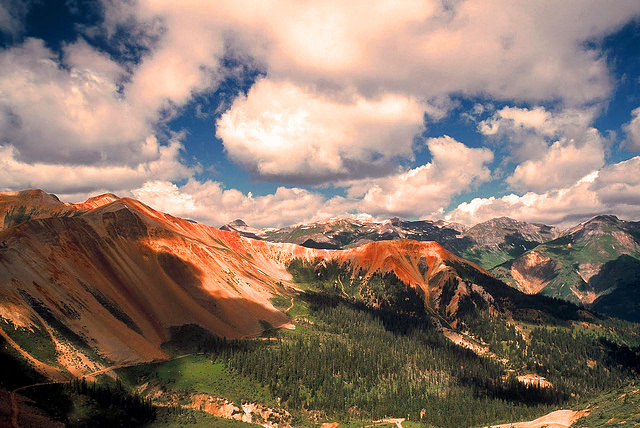 Many years prior, I drove around the mountain curve on highway 550 into Ouray. I saw the steam from the hot springs rising to the Mountains. I returned several times. One day my divorce, my mom’s death, and the surprise passing of my best friend provided the deep awareness of a fragile and temporary life, and I loaded my jeep and drove west to grieve and live out a dream in the Mountains. The large hot springs pool sits surrounded by Mountains and the town of Ouray — a tiny piece of Western history nestled in a bowl at the foot of the San Juans. I relax in the pool, drink water, and watch rock climbers, mountain goats, small avalanches, and the deer that come to feed in the adjacent park. Often I sit quietly for hours and think, other times I read, and occasionally I talk with regulars and tourists. In the winter, the steam rises from the hot water and often I can only see a foot or two in front of me. The pool fills with people when it snows, and white heads appear to float on top of the warm water. I reflected on my connection with nature while I soaked: I sat in a small skiff in the San Ignacio lagoon in the Mexican province of Baja California Sur bobbing in light waves. 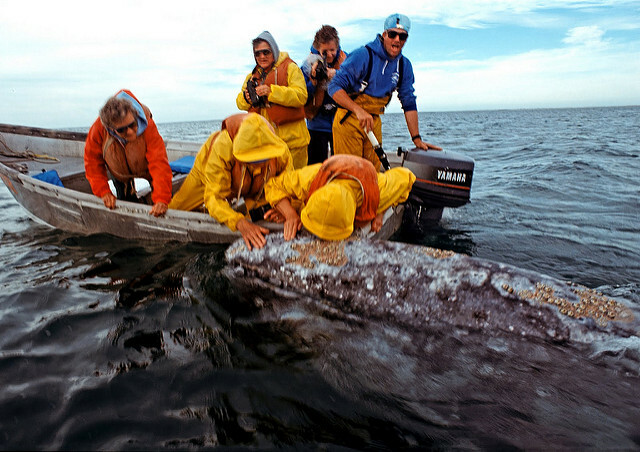 I watched as a 40-foot-long, 40-ton great gray whale surfaced slowly beneath the boat and gently introduced her new child to the boat’s elated observers. I peered into the large, serene eye of the mother and wondered: What was her world like? Her gentle and knowing return of my excited stare linked us in a mystical moment. I realized that in one slight movement she could destroy the boat and kill its occupants. Instead, she chose to form a relationship with us — a profound choice: destroy or relate — the essence of competing worldviews. Mother and child floated with the boat for a few minutes. The whales allowed the exhilarated humans to touch them and to lean over and kiss the barnacle covered parent before mother and child submerged slowly and disappeared. For a few short moments, the sky, the ocean, the people, the bobbing skiff, and the whale and her child were one. Nature is a form of love available to each of us. Maybe this moment of intimacy is God. I feel a deep sorrow for what we do so selfishly to the natural world at our own peril. I’ve had the sadness for a long time. At first I tried to push it away. Now I just feel it. Are we evil for consuming her so greedily? I fear we are. Can we change how we think? I hope so. We need a renaissance of authentic people who understand, who do what they can to help a world in transition, who expand our compassion so we can change the way we live on our planet so future generations can enjoy what I’ve enjoyed.